A Makeup & Beauty Blog – Lipglossiping » Blog Archive Christmas Gift Guide-a-palooza: Nailing it! I’m not really a trends girl, and I don’t do much in the way of nail art – when it comes to my talons, I like shiny manicures with a side of sparkle whenever appropriate! I have a heap of nail art “implements” that I sometimes have a play with when I’ve got more than five-minutes to myself (the problem with being self-employed is that you’re still plagued by the things that you should be doing on your day off!) and have been comtemplating picking up some of those el-cheapo nail plates from Hong Kong. Good idea/bad idea? Nail products make perfect Christmas gifts, especially in stockings! They provide a little bit of instant “oooh!”, are far less expensive than something like skincare and even if you get the colour wrong – it’s the kind of product that can be passed on to family and friends so it never goes to waste. Here are my top gifting picks for all you nailistas out there! Have you got a Sophy Robson-in-the-making? Always trying to steal your polishes, sticking their little heads in your good light when you’re trying to paint your nails (you can tell I’ve got one! ), and generally making a nuisance of themselves? This cute pack of non-toxic, water-based polishes from Little BU will make the perfect distraction – the only problem will be deciding which colour to choose first! Jessica are a top-quality nail brand that for some reason, don’t seem to get a lot of love in the blogosphere – back in 2008 I was in love with almost every release the brand put out, but they’ve fallen off my radar somewhat in recent times. If you get one gift for a nail polish addict this year, make it this one. Crystal nail files have revolutionised the way I care for my nails and have enabled them to grow stronger and longer than ever before. Sadly, my addiction to nail polish undid all that good work BUT I wouldn’t be without mine. Treat a loved one to prim and polished nails this winter with this sophisticated trio of neutral nail shades from bargain brand, ELF. Be a total darling and include a plain white/black polish to the gift and introduce them to the world of ombre! The fun is set to continue. Style over content? Apparently not this time as most reports seem to suggest that the formula is almost as lustworthy as the packaging with DIOR’s adorable Vernis Diorific nail polishes from their Christmas Grand Bal collection. They’re also completely crying out for a bit of upcycling once emptied – baubles anyone? This bijou box of tricks is designed to rattle about in your handbag, patiently waiting until disaster* strikes. Broke a tip? Pulled a hangnails? Got a snag? All these things can ruin a girl’s day (sort of), so enlist some help from this trio of mani-managers and make use of the contents which include: Tweezerman Mini Hangnail & Cuticle Snipper, Tweezerman Pocket Sapphire Nail File, and Tweezerman Mini Pushy & Nail Cleaner. Know any nail pickers? cuticle-chewers? 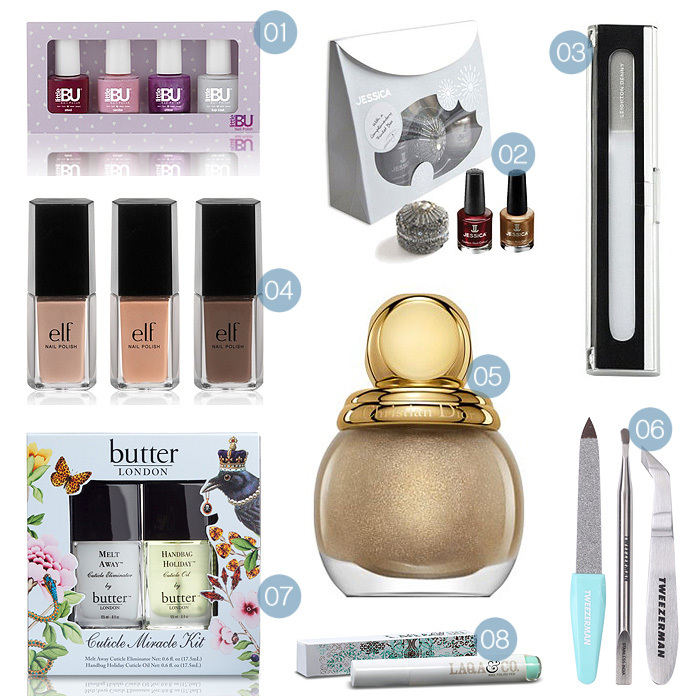 Give them the gift that keeps on giving with this Cuticle Miracle Kit from Butter London. The Melt Away Cuticle Eliminator promises to banish dead skin without the need for cuticle cutters (ouch), while the Handbag Holiday Cuticle Oil will keep your fingers looking fine! Three reasons why you know someone who needs this in their lives. A). It’s an awesome Spring shade! B). It has the most adorable packaging, ever! C). It’s NAIL POLISH IN A PEN FFS! Just how much more fun do you need whilst applying your nail lacquer huh? !